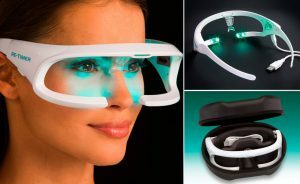 You are intrigued by all the buzz surrounding light therapy glasses for the treatment of Seasonal Affective Disorder. But you don’t know whether wearing fancy looking eyewear can actually give you some respite from the mid-winter blues that seem to be sucking the life out of you. It does. Light therapy glasses have become extremely popular for one reason, they work. If you find that your productivity wanes terribly come winter, you go from slothing occasionally to hibernating the whole day, your sleep cycle is messed and you feel terribly depressed, then you might be a candidate for SAD. And SAD glasses are a simple remedy for this extremely debilitating condition that can affect productivity and make life miserable. The best part is that you don’t need a prescription to buy one. But being a relatively new form of therapy, there’s a lot of mystery surrounding it. If you are considering buying one of these, then you can be left at the mercy of hard selling, sleazy, sales guys. To find out the best light therapy glasses, we spoke to people who have experienced SAD in the recent past and have been using SAD glasses for the treatment. We spoke at length about their experiences with the glasses, the type of results they achieved, their comforts and discomforts while wearing them and their recommendations for the best glasses in the market. And as expected, most of the hyped and overpriced light therapy glasses didn’t make the list. Luminette 2 is the second iteration of the Luminette range of portable light therapy glasses. This one has a sleeker, ergonomic design that fits over your existing eyewear. It is lightweight, can be worn just about any time and doesn’t limit your ability to go about your daily chores. The Luminette 2 has 8 LED lights angled downwards. It uses a patented light wavelength, which is a form of white light with a hint of blue thrown in. While the light is not aimed at your eyes, it reflects off the inner surface of the eyewear and goes into your eyes, thereby helping alleviate the symptoms of SAD. You can choose from three intensities, 500, 1000 and 1500 lux. And it is extremely intense even at the lightest setting, especially if you are new to it. Work your way up from the lowest setting. If you find that you have to squint your eyes, don’t worry. That’s completely normal. Each session lasts for about 20 minutes at the highest intensity and 45 minutes at the lowest. The lights flash multiple times to indicate that the session is done. The glass itself has an adjustable silicone nose piece and fits perfectly on your face. You might find it difficult initially to go about your household chores or office work when you are wearing the Luminette 2, especially in a dimly lit room. But you will eventually get used to it. Just increase the brightness of the lights in the room or your laptop screen if you find it difficult to see. Coming to the most important part, the Luminette 2 is very, very effective. It helps regulate your sleep patterns, keeps you energized in the mornings and can help tremendously if you travel a lot in different time zones. Very bright light that takes some getting used to. Some users might find it difficult to see anything around them unless the room is brightly lit. 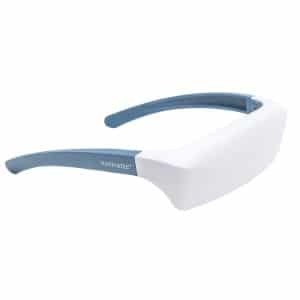 The Luminette 2 is often directly pitted against the ReTimer Light Therapy Glasses and for good reason at that. Both these SAD glasses were launched roughly around the same time. They have identical features and even shared identical price tags until Luminette dropped the price recently. Even then, ReTimer Gen 2 continues to enjoy unprecedented popularity among people with SAD. It is sold in 46 countries and is often advertised as the ‘Gold Standard’ in light therapy. The ReTimer light therapy glass has a better build quality as compared to the Luminette 2. It is comfortable to wear, is easy to adjust the fit and the nose piece is softer. 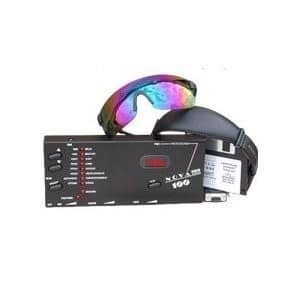 You can wear it over your existing eyewear and you can easily perform routine tasks with the light switched on. The light at its peak is more of a green wavelength than the white one in the Luminette. There is a hint of blue but research seems to favor the green more. More importantly, it complies with IEC 62471 safety standards and is completely UV free. 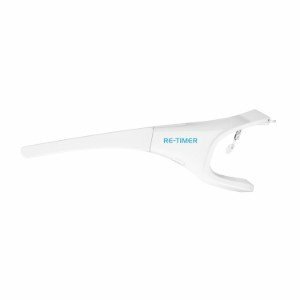 The Re Timer is extremely effective for people who have erratic work hours. It helps retime the body’s circadian clock and regulates sleep patterns. If you are finding it impossible to sleep due to insomnia, nocturnal hypoxemia after an injury or illness or due to stress, the ReTimer is for you. The only possible niggle that we have is that it has only two intensity settings, 300 Lux and 500 Lux. So, after wearing these for a few months, you might find the light a little weak as your body gets adjusted to it. But that’s not a biggie. It works just fine for many users. At 500 Lux, the highest intensity is too less as compared to the Luminette 2. The Pegasi SAD light therapy glass is a swanky, new generation device that boasts of features like a patented flat LED panel and Bluetooth 4.0 connectivity. It connects to your Smartphone and you can monitor battery levels as well as set the desired intensity from your smartphone app. And if you hate gadgets as much as we do, you can do all of the above manually. All it takes is a double click to increase intensity as well as power the device off. The Pegasi looks cool. The matte black frame, the flat LED with the blue wavelength light and the stylish ergonomic design are right out of the latest fashion catalog. When not in use as a light therapy device, this can easily double up as fashionwear. The design is very user-friendly as well. There’s an ultra-comfortable soft nose rest, a smart touch soft button that’s perfectly positioned for easy access and a universal fit design that’s size adjustable. 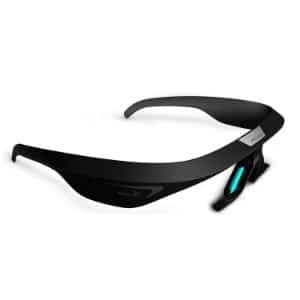 Unlike the earlier two SAD light therapy glasses in this list, Pegasi uses a Blue wavelength only. And we are all for it because it works. We spoke to customers who have achieved excellent results with the Pegasi in just a couple of weeks. It helps reduce insomnia, improves sleep patterns, improves mood and can help with jet lag. You can choose from three intensity levels and the glass switches off automatically after each session which lasts from 20-45 minutes. Uses a blue wavelength only. Light therapy affects different people in different ways and some people respond better to a mixed wavelength. The AYO blue light therapy glass is designed more like a headband. It is incredibly sleek, looks stunning and can be worn over sunglasses or eyewear. Like the Pegasi, it is Bluetooth compatible and syncs with your smartphone, and you can alter most of the settings on the GoAyo app. We love the blue and white dual tone on the Ayo glasses. It looks refreshing and is a welcome change from the subdued, all-black glasses that seem to be the norm these days. There are no buttons on the slim frame and it fits comfortably on your face. So, syncing it with your smartphone is the only way to use it. The app is pretty advanced. It starts off by trying to find your ‘chronotype’ by determining whether your circadian rhythm makes you a morning or an evening person, your body’s core temperature at its peak, your melatonin off set levels and so on. While most people are hardwired to their smartphones, we found this a little limiting. What if your smartphone battery is drained and you need an urgent boost of Light therapy energy? On a positive note, this reduces the risk of the soft touch buttons getting damaged due to frequent use. The Ayo glass comes with a capsule-shaped travel case that also doubles up as the charger. Somewhat like a docking station for Apple devices. It looks cool, is compact and it charges the unit completely in about an hour and a half. The glass emits a blue wavelength of light (475nm) which is soothing and is touted to be very effective in helping boost energy as well as regulating sleep patterns. If you are feeling a sudden energy dip at a time when you need to be most productive, power on the Ayo and you will feel refreshed in the next 20 minutes or so. No old-school manual buttons on the device. So, you have to use it through the smartphone app only. The Photosonix Nova Pro 100 is an old, tried and tested device that’s often called ‘The Mind Machine’. It not a portable SAD glass. Instead, it is a complete audio-visual light therapy system that includes a blue stimulation glass with pulsating lights, stereo head phones and a light and sound synthesizer unit. 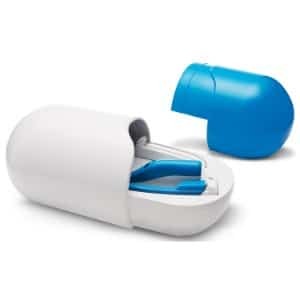 It works equally well if not better than the portable SAD glasses and is best suited for people who have the time to power on the unit and sit undisturbed for therapy sessions. The Photosonix Nova Pro 100 is built like a tank. The synthesizer unit has a durable metal casing and old school rotary switches. There are bunch of LED lights on the control panel and it has a psychedelic effect when powered on. The glasses have 4 white LEDs for each eye. Like the Luminette 2, the lights aren’t aimed directly at your eye. Instead, it is angled downwards. When the light beam reflects off the Blue surface of the glass, it casts a soothing blue hue which is very relaxing and best suited for correcting disturbed circadian rhythms. Each Nova Pro unit includes 100 built in therapy sessions. There are 40 sessions for newbies who are using the machine for the first time, 10 sessions that alter your mood instantly and 50 sessions for pro users. You also have the option of downloading an additional 100 sessions. The sessions can range from sleep inducing to complete mind altering. There are customers who have used the Nova Pro and claim that it transcends them to a completely heightened state of awareness. We wouldn’t comment on that. But we have no reason to doubt the authenticity of those claims. For people using it for SAD, the Nova Pro 100 improves sleep, boosts energy, reduces sluggishness and improves mood. Light therapy glasses are fairly new. And like any new technology, there’s a lot of hype and bro science doing the rounds of the internet. Does a blue light work better than a red light? Does it have to be overly bright? Can it cause macular damage? Here are some answers and some tips. There are two types of SAD light therapy devices. Stationary ones like the Photosonix Nova Pro and portable glasses like the rest. Pick one depending on the availability of time and your convenience. If you cannot dedicate 30 minutes every day to the sessions, the portable SAD glasses will be better suited for you. All light therapy devices emit completely safe light wavelengths that do not cause macular damage. So, irrespective of whether it’s a blue light (ReTimer Generation 2) or a white one (Luminette 2), it won’t hamper your vision. Also, different people have different preferences about the color of the light that they stare into each morning. Some, prefer a white light whereas others prefer a green one. As of now, there’s nothing to differentiate between each wavelength when it comes to the effectiveness. The sad light therapy glasses have to be comfortable. It must fit perfectly on the face and the nose piece has to be soft. That’s precisely why we have picked the Luminette 2, the Retimer Gen 2, the Pegasi and the Ayo. All four of these sad light glasses are top rated for comfort and ease of wearing. We all like fancy features like Bluetooth connectivity, automatic shut off after a session, long battery life and quick recharge times. All these glasses are crammed to the brim with features. They are user friendly and provide complete value for money. If you are struggling with SAD or work erratic time frames or are suffering from a damaged circadian rhythm, then light therapy has the potential to completely change your life. These glasses are reputed, not overly expensive and easy to use. What’s stopping you from giving it a shot? If light therapy glasses aren’t working for you, try out some of our Light Therapy Lamps or Red Light Therapy Devices!